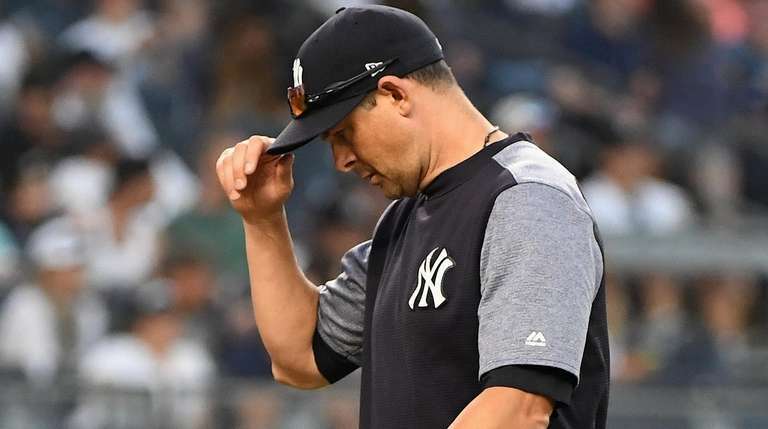 Not many 91-win teams get booed in their own ballpark, but these Yankees do, and it happened again, more than once, during Saturday’s 8-7 loss to the Blue Jays. That’s not to say they didn’t deserve the jeers early on. CC Sabathia teed up three home runs in the span of his seven-out afternoon, and the Yankees’ lineup, still pining for Aaron Judge, whiffed 10 times and stranded six runners through the first five innings. They wound up striking out 16 times and stranding 10 runners. The only reason this game even looked respectable by the end was the Blue Jays’ charitable deployment of Tyler Clippard, who was an all-too-predictable accomplice for Miguel Andujar’s grand slam in the seventh. Didi Gregorius chipped in by smacking a pair of home runs, breaking his own year-old record for a Yankees shortstop with No. 26, but the accomplishment felt hollow afterward. This recent malaise is nothing new. The Yankees have been playing less-than-inspired baseball for a while now. Saturday’s loss dropped them to 29-24 in the second half, including 6-7 in September. Since moving to 50-22 with a 41-13 stretch, they are 41-35. The division is long gone, with the Red Sox now on pace to pop bottles in the Bronx this week during a three-game series that starts Tuesday. And the next domino to fall is home field for the wild-card game, a scenario that was unthinkable a month ago, as the A’s have closed to within 1 1/2 games of the Yankees for the top wild-card spot. Truth be told, history teaches us that September momentum matters very little when it comes to playoff success, so this Yankees’ swoon doesn’t necessarily set them up for a one-and-done postseason cameo, whether it’s played 3,000 miles from the Bronx or not. As ugly as this has been to watch lately, there are a number of examples to back up Boone’s rah-rah optimism. The 2014 Giants went 13-12 in September, lost seven of their last 10 games and had a negative-12 run differential for the month before going on to win the World Series. The 2006 Cardinals wrapped the season on a 25-36 clip, losing 9 of 12 to finish, but knocked off the 97-win Mets in the NLCS and beat the Tigers in five games for the title. Even the 2000 Yankees, who won a total of 87 games, went 5-16 down the stretch and ended the regular season on a seven-game losing streak, yet still righted the ship in time to topple the Mets in the Fall Classic. Maybe Joe Torre’s crew still was able to surf the momentum of the dynasty wave in getting through that October, but whatever the reason, things ultimately clicked when they had to. Can Boone’s Yankees eventually do the same? There’s evidence to suggest they can. A big plus is Gregorius looking productive again since coming off the disabled list, with four home runs and nine RBIs in his past five games. Aroldis Chapman also is expected to return from the DL this week after being sidelined for nearly a month with knee tendinitis. Those are two significant pieces that were missing during a large chunk of this Yankees’ downward trend, but the third, Aaron Judge, is a far more iffy proposition. On Saturday, Judge was back launching batting-practice homers, something he can do blindfolded. But his return to rightfield Friday night was mostly a symbolic gesture as he’s not capable of hitting in games yet. And battling 98-mph fastballs on his hands is going to be a serious challenge with his wrist still experiencing some discomfort. For now, the Yankees can’t count on Judge being his same intimidating self. He’s admitted as much. But that’s not an excuse for everyone else on the roster. Boone & Co. shouldn’t be this bad, and they have two weeks to show that the symptoms they’re experiencing aren’t fatal to their October hopes. Soon is a relative term. Earlier than the seventh inning would have helped Saturday. Beyond that, the Yankees could use some self-correcting to hold off the A’s threat down the stretch. Otherwise, playing in Oakland for the wild-card game is going to feel a heck of a lot friendlier than the boos raining down on them in the Bronx.